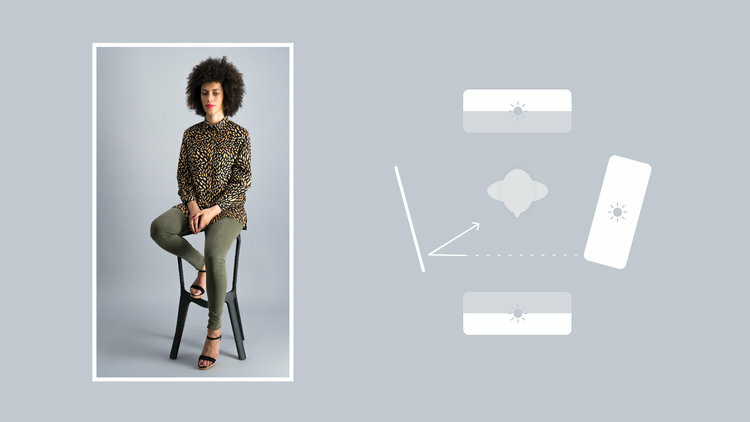 We guide you through 4 lighting techniques that will help you create beautiful images for your fashion e-commerce store. Research has shown that increasing sales through online fashion stores is heavily dependent on the types of images you feed your users. Unflattering pictures of the product you’re showcasing, inconsistency in your photos and sloppy content create doubt in your customers about what they’re going to get when shopping from your web-store. That’s why lighting is the single most important thing to look out for when creating photographic content. It can make or break your photoshoot. We’ve put together a tutorial that can help you understand how different types of lighting will affect your photographs. We’ll walk you through four ways of lighting your set in order to produce beautiful pictures and achieve that perfect, consistent look for your catalogue. What to be aware of at all times? A good rule of thumb to follow is that you should have one main source of light at all times, or key light for short. You don’t want lights crossing each other, resulting in multiple shadows because the outcome will look unnatural. This effect works nicely in e-commerce fashion photos because it adds a little bit of contrast in the photograph. That really brings out the texture of the product and it intensifies the overall mood in the image. By focusing on mood and texture, your customers can gain a better idea of what the product will be like. The key light in this scenario is on the right side, facing the object. The reflector is on the left side, also directed towards the model. The background is set to medium light intensity. As a result, some light is spilling on the front of the set. A soft shadow is coming off and because of this setup, you will be able to see that there is a very particular light direction. Introducing more dramatic lighting in your pictures is a great way to achieve a contrasted look of the clothes and to create a more emotionally-charged mood in the photo. In the final images, if you look into the model’s face, you’ll see the fall off from an intensely lit side to no light at all. The key light remains on the right side in full light intensity. However, you need to turn the reflector that’s on the left to black. It will reduce the amount of black being bounced back into the model’s face. Reduce the light in the background. Its intensity will be lowered as it goes away further from the subject. In return, this will create a darker shadow and a more intense, dramatic look. During the shoot, your model will be contrastingly lit in the middle. If you decide to go for the neutral lighting effect in your images, your customers will be able to see the full tone of the product that you’re showcasing. This setting is ideal for fashion e-commerce websites and web-shops in general. Turn the key light on the right side to full intensity. Also, turn the reflector on the left towards the model so it can reflect all the light back in. Switch the background light to full intensity. Do the same with the foreground. Overall, this will create much more neutral lighting and there will be less shadowing on the floor. If you’d like to visually pull the model away from the background in your photos, you should use soft lighting. By doing so, the real focus is on the subject and the products you’re trying to highlight. When you create such a setup, you get coverage everywhere and reduce any existing shadows. Angle the key light on the right away from the model and direct it towards the reflector on the left. There will be a lot less shadowing around the bottom. Once again, there’s a particular light of direction, however this time the light is being spread out and bounced around. This fills in the shadows. Dial down the lights in the background and in the foreground. By playing around with the lighting on your set, you can create very diverse effects in your pictures. Something else to keep in mind: some of the lighting effects you’ve used for your stills might not be suitable for video. That’s because the movement of the model can create big shadows that fall onto the background. These shadows can be quite distracting for the viewer and they will take the focus away from the product. In case you’re shooting stills and video on the same set in the same day, you should choose lighting settings that fit both. That way it will be easier for your customer to understand that this is the same product because the lighting is the same, keeping everything nice and consistent. In a video, a big dark shadow will take the focus away from the product. Avoid such lighting effects for your video content.